Take a piece of Mobile home with you! We have hundreds of shopping opportunities to fit every budget, style and taste. 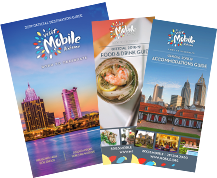 Specialty shops and boutiques can be found in the heart of downtown Mobile. Friendly merchants offer handmade arts and crafts, clothing, souvenirs and much more. Mobile also offers an impressive selection of antiques shops and galleries with a wide variety of collectibles, vintage finds and funky pieces. A huge Mardi Gras warehouse store is open year-round to cater to any festive whim. And, The Village of Spring Hill features locally-owned specialty shops featuring high-end clothing, jewelry, furniture and home accessories - you can definitely shop til you drop in Mobile!